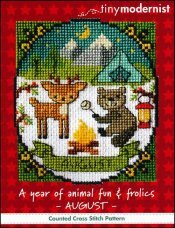 A Year Of Animal Fun & Frolics: August [C5334] - $6.00 : Yarn Tree, Your wholesale source for cross stitch supplies. Cross stitch pattern from Tiny Modernist. Look at these two adorable buddies enjoying a campfire while roasting a marshmallow. The moon & stars decorate the night sky, while the snow-capped mountains stand in the background. Shhhh...someone is having a good nights rest in the tent. Hopefully these two don't cause too much ruckus and wake up the humans! Stitch count is 53w x 61h.